Parasites and worms in humans can be the cause of intestinal discomfort, bloating gas and chronic constipation. Parasites can also infest the skin, in cases of scabies and the scalp in cases of ringworm. Anthelmintic herbs are used in herbal remedies to treat intestinal worms, often combined with laxatives. Problems arise when these herbs are overused, the harder the herb is on internal parasites, the harder it is on the body. 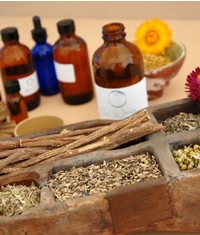 Herbs containing thujone, such as wormwood and tansy, can be toxic if overdosed. Gentler herbs like garlic and agrimony are much safer, and have fewer side effects, but generally take longer to work. Take an infestation of parasites seriously, and consult a qualified health practitioner, do not attempt to use home treatments for worms if you are pregnant. Agrimony contains the chemical compound agrimophol, which expels parasites. Agrimony is gentle and Tonic to the digestive system. Black walnut hulls offer safe worm intervention, but is not intended for chronic or long term use. Avoid herbal remedies including both heartwood and hulls. Butternut can be employed as a vermifuge. The expressed oil of the fruit removes tapeworm. 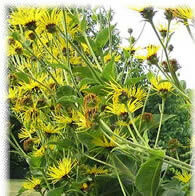 Elecampane treats parasitic infections, including roundworm, hookworm, whipworm and threadworm and the plant has long been used externally for scabies, herpes and other skin diseases from which it gained its country name scabwort. Oregon graperoot and goldenseal both contains berberine, which acts against the parasites Entamoeba bistolytica and Giadia lamblia. Tansy, like the classic dewormer wormwood, contains thujone, a powerful tool in the hands of a trained professional for expelling round-worm and threadworm. Tansy is of doubtful value as a worm treatment and is not without risk. Thujone is hard on the host as well as the parasites and toxic to the central nervous system if taken in too large doses or for too long. Maud Grieve. "Modern Herbal Volume 2" Harcourt, (1931) Tansy was largely used for expelling worms in children, the infusion of 1 OZ. to a pint of boiling water being taken in teacupful doses, night and morning, fasting. Note: Most modern herbalists warn against its use by laymen. The active constituents are toxic in large doses. Linda B. White, M.D.. "The Herbal Drugstore" , (2003) Oregon graperoot contains berberine, which acts against the parasites Entamoeba bistolytica and Giadia lamblia. James Duke. "The Green Pharmacy Herbal Handbook" Rodale Books, (2000) Elecampane treats parasitic infections, including roundworm, hookworm, whipworm and threadworm. Linda B. White, M.D.. "The Herbal Drugstore" , (2003) Safe and effective taken over time, garlic's power to kill roundworm, pinworm, tapeworm, and hookworm has been confirmed by scientific studies. Maud Grieve. "Modern Herbal Vol 1" Harcourt, (1931) Besides being unrivaled as a stomachic tonic, Gentian possesses febrifuge, emmenagogue, anthelmintic and antiseptic properties, and is also useful in hysteria, female weakness, etc. Maud Grieve. "Modern Herbal Volume 2" Harcourt, (1931) Butternut is a mild cathartic like rhubarb; it does not constipate and is often used as a habitual laxative, also for dysentery and hypatic congestions. It has been employed as a vermifuge and is recommended for syphilis and old ulcers. The expressed oil of the fruit removes tapeworm.